As we follow travelling friends around the world, this week we are with Ashleigh in the Philippines. As part of her tour of South-East Asia, the Philippines was a place everyone recommended and it really did live up to expectations. Starting off from Banaue, onto Palawan then to Cebu here are a few moments to share with you all. After landing in Manila, we decided to head North to a little town called Banaue. 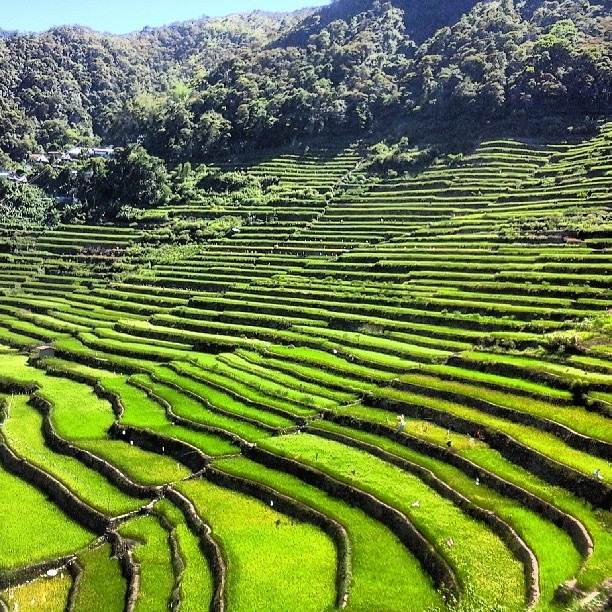 It’s a picturesque area in the Philippines where rice terraces form a step-like formation for miles on end located approximately 1500m above sea level. We took an overnight (10 hour) bus ride on a mostly bumpy road which left us slightly sleep deprived. Arriving at 7am, and feeling a little dazed, we decided to make the most of the beautiful sunny weather and took a trip to Batad – this is where famous rice terraces are as seen on travel postcards around the world. 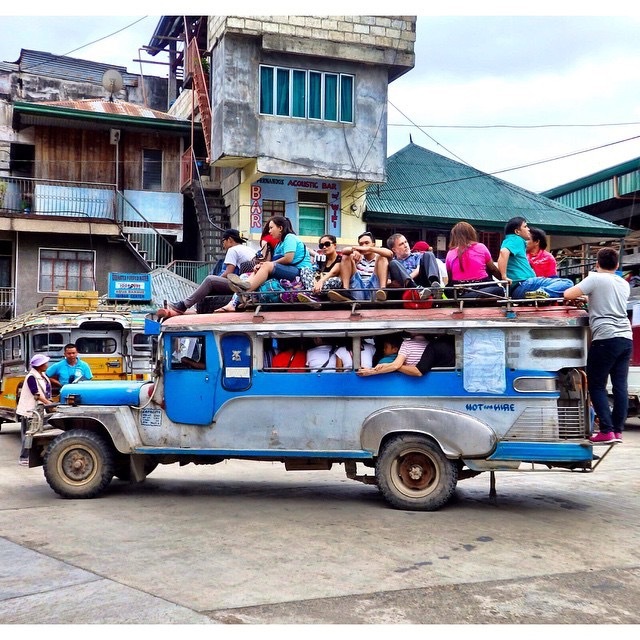 Enduring another 45-minute bumpy ride on top of a jeepney (like a big tuktuk, you can find them everywhere!) we arrived to begin our guided trek down to the terraces. The beginning of the trek was beautiful and heading downhill this could only mean one thing – uphill on the way back! Saying that it was completely worth it as the views were breathtakingly spectacular. You can see why the locals call this the eighth wonder of the world. The terraces are expertly carved into the hillsides and we were lucky enough to be able to walk right through them! After a few hours walking, we also came across a fresh-water waterfall, perfectly timed to cool off and have a refreshing dip. We then headed back to the top where we sat and had lunch overlooking the terraces. A perfect panoramic view and a well deserved feast! 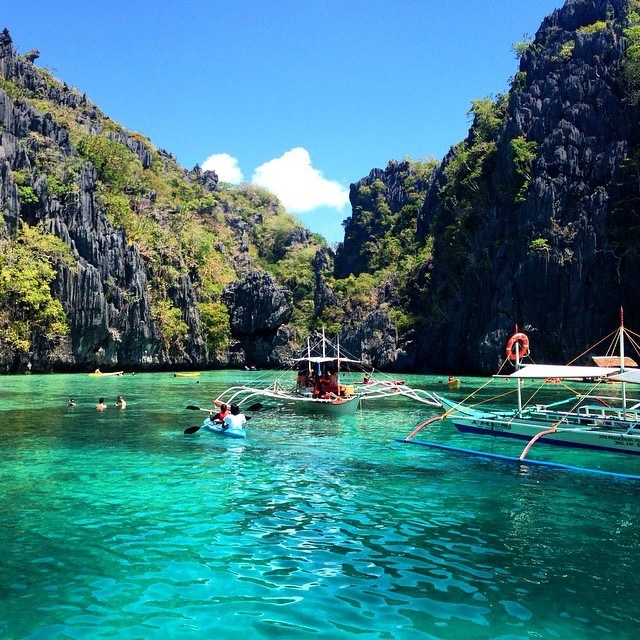 When we got back to Manila we planned our next move – onto Palawan! We took a flight to Puerto Princesa in Palawan, on the west coast of the Philippines. Taking a boat out to Honda Bay, this is the perfect place to island hop! 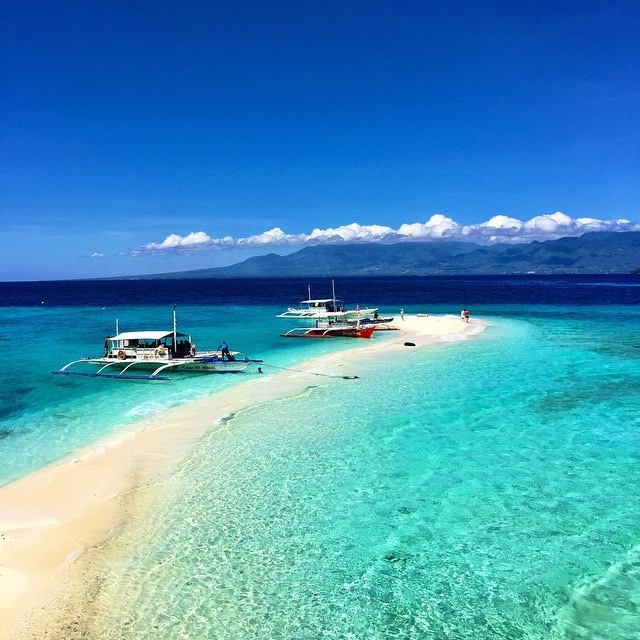 We visited two islands, Panadan and Starfish island as well as stopping at a few spots for snorkeling. Panadan island was my favourite, crisp blue waters lined with palm trees and a few cabanas. We settled for lunch on this beach with the options of beef, chicken, pork or fish with no description of what it came with. It turned out to be an amazing BBQ with rice and some sweet vegetables – a total surprise and just delicious! The next day we took a bus up to El Nido, famous for its limestone cliffs and islands surrounding the sea. We took a minivan which took around 6 hours, arriving late afternoon. The town itself is quaint but has plenty of restaurants and a few beach bars often playing live music. We took two boat trips here, the most popular being the visit to the big and small lagoons while stopping at lots of secluded islands along the way, and plenty of snorkeling. Food again was delicious which was a fresh BBQ on the beach with fish, crispy pork, chicken, rice, eggplant and salad finished off by fresh pineapple and watermelon. You will also appreciate the sunsets, they’re pretty special! We spent a few more days there and also visited a beautiful beach called Las Cabanas, a short 15 min tuktuk ride away. When we first arrived we were so fortunate to have the beach to ourselves! 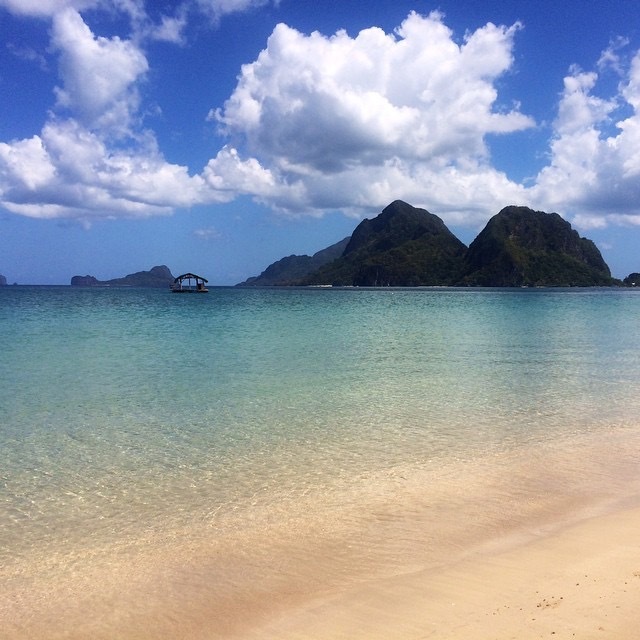 Perfectly still clear-blue sea, soft sand lined with palm trees and the coolest water to freshen up in! We ate lunch at a little beach-front shack and opted for a toasted sandwich, filled with bacon, pesto humous, tomatoes and salad. They also served some amazing fresh mango shakes! 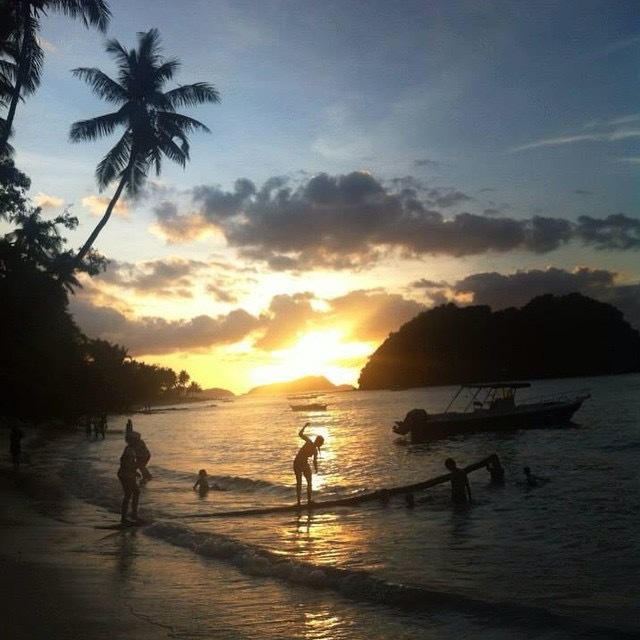 El Nido definitely exceeded our expectations and it’s a must for travellers exploring the Philippines! Leaving El Nido and Palawan we flew on to our next destination, Cebu, in search of whale sharks and waterfalls. We arrived at 6pm and took a 3-hour bus straight down to Oslob. After checking into our guesthouse we met two locals who had offered to take us on their motorbikes to the whale shark point in the morning. The next day we left at 6am and it was an absolutely incredible experience. Naturally, I was a little apprehensive as I’ve never been in the water with anything quite so large but once you see these ‘gentle giants’ as they are so often referred to, it was incredible. You could really swim up close and watch them feed, it was easy for us to relax and appreciate how graceful they are. We were lucky enough to be able to snorkel with them for half-an-hour, including seeing ‘lucky 7’, the 7m whale shark! Afterwards we had breakfast overlooking the sea, a tasty ham and vegetable omelette, then our local motorbike friends took us to Tumalog waterfalls. Stunning blue rock pools form at the bottom of these huge falls! Luckily we went quite early, before the crowds arrived. The afternoon was free and our new local friends owned a fishing boat and offered to take us to Sumilon island. The boat ride took 50 minutes, arriving at low tide, which showed this spectacular sandbar. I’ve never seen water so blue and so clear, we spent the afternoon swimming and sunbathing on this little piece of paradise. For those of you with a slightly larger budget you can stay on this private island at Bluewater Sumilon which offers fun activities and boat excursions, as well as private parties, dinners and has a tranquil spa. Resort will guarantee room reservations after 6:00 pm with a deposit or a credit card guarantee. 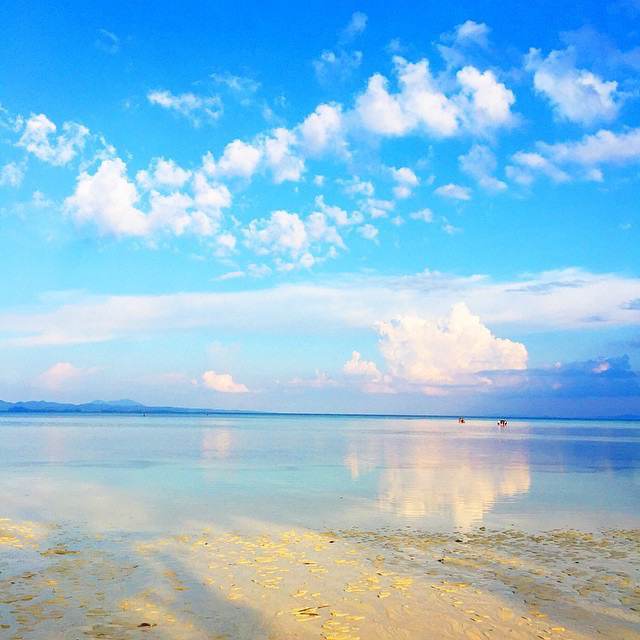 The Philippines really is a place for everyone, the backpacker on a shoestring budget, and also the traveller who is lucky enough to be accustomed to five star luxury. The food, beaches, scenery, views, wildlife and people make this place unforgettable!